This book takes place in summer in a small and poor town called Carp. (misread this as crap multiple time) Every school day you donate a dollar and at the end of the year that is the pot. If you win the game, you win the money. In this case it was around $60,000+. Only seniors that just graduated are the ones to play panic. There are a variety of difficult challenges and tasks that are terrifying and illegal. The seniors risk their lives, competing out of desperation and the seek of revenge. Panic is played in secrecy, you must not get caught. Heather and Dodge are both participants of Panic, both succeeding in the first challenge – cliff jumping, a traditional way of entering panic. It is written in dual perspective while maintaining the omniscient voice of the third person narrator and speaking at both Heather and Dodges perspective which changes back and forth each chapter. 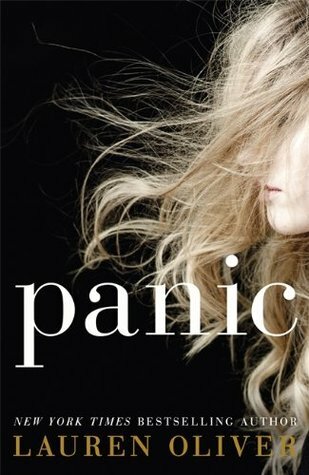 Check out Panic on goodreads! Visit me on bloglovin’ – just discovered it! Posted on May 9, 2015 May 9, 2015 by manyreads	This entry was posted in Book Review, Panic and tagged book review, Lauren Oliver, Panic. Bookmark the permalink. Oh my gosh! You just made me want to read it! Added it on my books to read! Unfortunately, I can’t say that I liked Panic as much as you did. Frankly, I found it cheesy and bland. But I definitely see the appeal of the book. Aww, that’s a real shame! There is quite a lot of mixed reviews for Panic. I feel you either love it or hate it.